"Our goal and our initiative is to find those areas, come up with an adequate business case that makes sense,” said Coltrain. “And even if it takes us seven or eight years return some investment back into the company for it, that's what we're willing to do, so that we can make sure people aren't left behind." Now that TriCounty and Wilkes have merged, the resulting entity has more resources to develop networks and to seek sources of funding. Wilkes received approximately $21.6 million in federal stimulus funds in the form of grants and loans in 2010. 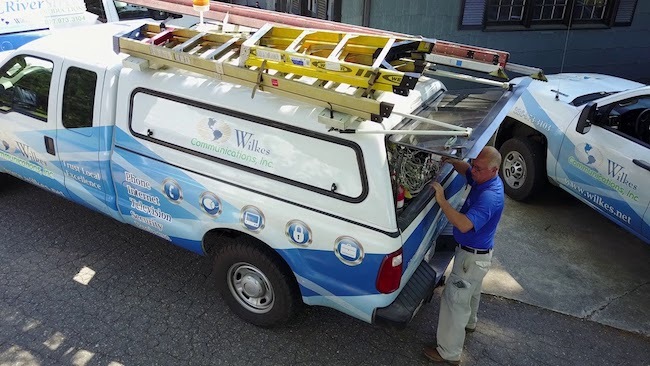 This past summer, Wilkes received $32 million in Connect America Fund Phase II (CAF II) funding in order to connect some of the most rural and unserved areas. With the announcement that the USDA plans to provide $600 million in grants and loans for broadband deployment, the cooperative anticipates applying for more. "We've put people on the moon,” said Coltrain. “But we're still trying to get rural broadband developed across our country. And the reason for the delay is the sheer cost of getting it out." Co-ops Are "Getting It Out"
Co-ops across rural America are taking the initiative where national Internet access providers don’t see large profit centers. North Carolina is one of the states where urban dwellers typically have decent services and may even have choice, but folks living outside of the larger cities often consider themselves fortunate to have access to DSL, which is unacceptable. Cooperative board members who are part of those less urbanized communities don’t want their local economies to dwindle and disappear. They also hear cooperative members express a demand for connectivity in order to pursue better educational opportunities, entrepreneurship, and telehealth options. Co-ops already have infrastructure in place, along with personnel and equipment that can facilitate deployment and operation of broadband networks. And rather than run by distant companies with headquarters across the country, rural electric and telephone cooperatives answer to member owners. Board members typicallly interact with subscribers in the communities they serve; they have personal reasons to take steps to build up their communities. Read more about how cooperatives are bringing fiber connectivity to areas left behind in our 2017 report, Cooperatives Fiberize Rural America: A Trusted Model for the Internet Era.